Stones made of cholesterol -- This is the most common type. Cholesterol gallstones are not related to cholesterol level in the blood. In most cases, they are not visible on CT scans. Stones made of bilirubin -- These are called pigment stones. They occur when red blood cells are destroyed and too much bilirubin is in the bile. 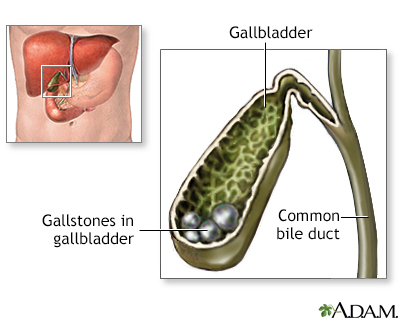 Gallstones are more common in women, native Americans, Hispanics, people over age 40, and people who are overweight. Gallstones may also run in families. Many people with gallstones do not have any symptoms. The gallstones are often found during a routine x-ray, abdominal surgery, or other medical procedure. However, if a large stone blocks a tube or duct that drains the gallbladder, you may have a cramping pain in the middle to right upper abdomen. This is known as biliary colic. The pain goes away if the stone passes into the first part of the small intestine. Pain in the right upper or middle upper abdomen for at least 30 minutes. The pain may be constant or cramping. It can feel sharp or dull. Most of the time, surgery is not needed unless symptoms begin. However, people planning weight loss surgery may need to have gallstones removed before undergoing the procedure. In general, people who have symptoms will need surgery right away or soon after the stone is found. A technique called laparoscopic cholecystectomy is most commonly used. This procedure uses small surgical incisions, which allow for a faster recovery. A patient can often go home from the hospital within 1 day of surgery. In the past, open cholecystectomy (gallbladder removal) was most often done. However, this technique is less common now. Endoscopic retrograde cholangiopancreatography (ERCP) and a procedure called a sphincterotomy may be done to find or treat gallstones in the common bile duct. Medicines may be given in pill form to dissolve cholesterol gallstones. However, these drugs may take 2 years or longer to work, and the stones may return after treatment ends. Rarely, chemicals are passed into the gallbladder through a catheter. The chemical rapidly dissolves cholesterol stones. This treatment is hard to perform, so it is not done very often. The chemicals used can be toxic, and the gallstones may return. Shock wave lithotripsy (ESWL) of the gallbladder has also been used for people who cannot have surgery. This treatment is not used as often as it once was because gallstones often come back. You may need to be on a liquid diet or take other steps to give your gallbladder a rest after you are treated. Your health care provider will give you instructions when you leave the hospital. The chance of symptoms or complications from gallstones surgery is low. Nearly all people who have gallbladder surgery do not have their symptoms return. In most people, gallstones can't be prevented. In people who are obese, avoiding rapid weight loss may help prevent gallstones. Jackson PG, Evans SRT. Biliary system. In: Townsend CM Jr, Beauchamp RD, Evers BM, Mattox KL, eds. Sabiston Textbook of Surgery. 20th ed. Philadelphia, PA: Elsevier; 2017:chap 54. Wang D Q-H, Afdhal NH. Gallstone disease. In: Feldman M, Friedman LS, Brandt LJ, eds. Sleisenger and Fordtran's Gastrointestinal and Liver Disease. 10th ed. Philadelphia, PA: Elsevier Saunders; 2016:chap 65.